The existence of the MMO Final Fantasy XIV has not been easy because of many problems and faults with which he was born, but Square-Enix has been making great effort to clean up and revitalize what Yoichi Wada sometime called "a great damage to the franchise "and now we present the result with the announcement of the relaunch of FF XIV . The game has been renamed to Final Fantasy XIV: A Realm Reborn with a new trailer and with promises of a complete rebuilding from the ground up, focusing on the concept of a rebirth for the world and for history of it. Since we announced our plans for the future title in October we have been working tirelessly to include all the elements that we have promised in Final Fantasy XIV: A Reborn Realm, we announced today. This new title not only becomes a symbol of a brand new Final Fantasy XIV, but also marks the beginning of a new stage as the latest title in the series of FINAL FANTASY. Hope you excited! Final Fantasy XIV: A Realm is Reborn disponibe for PC and Playstation 3 and we know more about him during the GamesCom the following month. Will you join the wave FF XIV Free to Play? Halo 4 promises to return to those moments of action that the great soldier of the green armor made ​​us live in the first three games of the series. The fans are very eager for the arrival of the game to stores, and 343 Industries and Microsoft knows, maybe that's why you have decided to show the Xbox 360 Legendary Edition Halo 4 is planning to launch alongside the game. The console has a truly spectacular design, bright and reasons as those who have always decorated the game menus. A very able will undoubtedly embarrass more than one, which will arise to do with your current console to get to that model. The Pandaren come to Azeroth in the first days of autumn. Blizzard has announced the official launch date of the fourth expansion of the popular massively multiplayer role playing online (or MMORPG) World of Warcraft, that despite the decrease in the number of players signed to the same unique, stable base of more than ten million heavy users, which in recent months have experienced the struggle to save Azeroth from the clutches of Deathwing and his minions, both members of the Alliance and Horde. September 25th is the date chosen by the U.S. company to launch this expansion brings a new territory to explore, a new race and a new playable class, which in the past year has been allowed to see from images and videos published by Blizzard. Its price is similar to that seen in other previous expansions: about 35 euros. 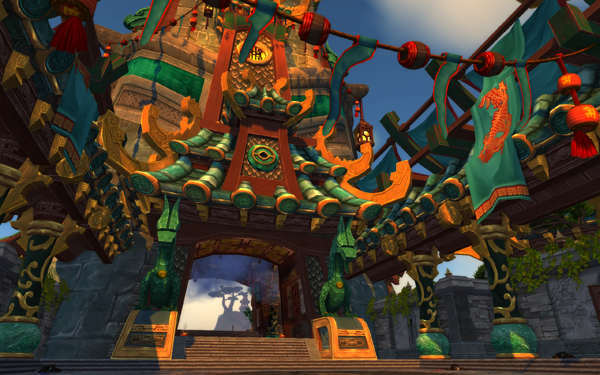 Pandaria will be the new continent, with a much more Eastern than seen in Azeroth, bringing a new adventure for World of Warcraft will return to test both the Alliance and the Horde, main factions hostile to each other that inhabit Azeroth. 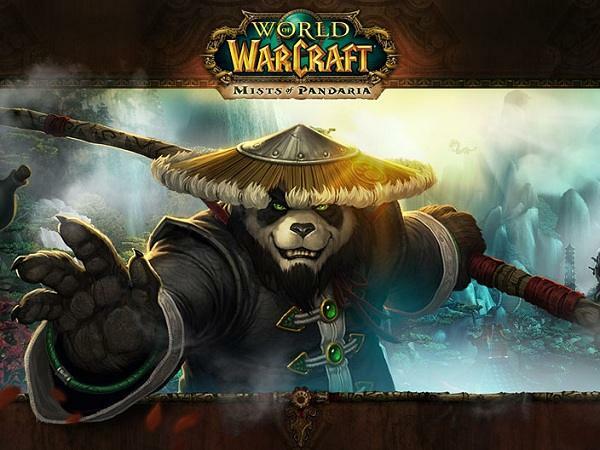 Not everything will be advantages for the monks or the Pandaren, there will be new skills and new levels for the remaining classes, which may extend to level 90 and will receive new talents for each of their fields of specialization, all together with a new balancing classes that will ensure that no class is above the rest thanks to the modifications of the game, either in the field "player vs. player" as in dungeons or bands. With this expansion to Blizzard seek to recover more than one million players lost in recent months and attract more fans of multiplayer role-playing genre with a massive content update, which translates into a new world to explore, new quests , dungeons and bands of ten or 25 players that both clans and players organized through the strip search seek complete not only to continue the course of the history of World of Warcraft, but also for the loot they can find them for improve and become the best players in his class. What happens when we mix a large game studio like Insomniac Games (creators of the Ratchet & Clank franchise on consoles as well as Spyro and Resistance), with a game similar to Pokemon - the idea of ​​capturing and training pets - and we put a some base building and resource management? For Outernauts, a new game on Facebook. The game mixes some odious practices implemented by Zynga (like "Energy" is exhausted when we perform actions or the desire to share everything we do in the game), but also implements the mechanics pretty well made popular Pokémon: we have different kinds of pets / monsters that can evolve, but also have skills that make them strong / weak, depending on the kind of enemy. After choosing our first child, we will go through a tutorial that shows us the basics (strengths / weaknesses of each), as well as introduce the concepts of building our base (which we will explore other planets). If you can ignore the artificial limitation of Energy, the game is fun. There are many games in both mobile and social networks that are based on old legends or games that have been successful in the past and, with minor modifications and keeping the same gameplay, these classics again relaunched and even recover your posts lists of titles played. 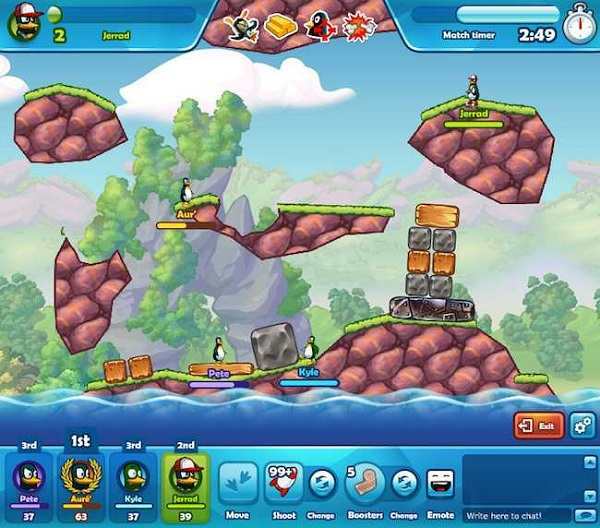 A clear example is Crazy Penguin Wars, an action game developed by Digital Chocolate that we remember the classic Worms, where a group of worms were facing each other to dominate the territory. The game has similarities with the classic Worms Armageddon are many, with a style closer to Facebook but with action and fun of this classic PC game. Our goal: kill all the penguins of the enemy. To do this we must use an arsenal that we have available and consider elements of the territory as altitude, wind, or the level structure, as important factors that often give us victory or we will fail. A typical example of the interaction between weapons and the field is the classical weapon: rocket launcher whose projectile will go off depending on the wind or the height at which we are. Other weapons such as grenades, will not be affected by factors such as wind, like the other weapons we can find throughout this war between penguins, for which there will be many games to practice for reaching to achieve much of the basic arsenal have available. The development system of the game this game is like in Worms: by turns, penguins move around the map and make use of any weapons they have available to stop any of the enemies you have at your fingertips. We will have just under three minutes for each turn, and made ​​our attack the turn will end instantly. We will have a defined quantity of life, which will lower the attacks as we receive or falls to suffer in combat. If we fall into the sea, located in the lower zone map, we will die instantly. The penguin remains standing above the rest to win the game. Each team will consist of four penguins, which can be Facebook friends or the computer, so you will not need anyone's help when playing. There will be room for customization, because we can edit our penguin from scratch , from colors to items such as hats, glasses or eye patches pirate. We will also have the ability to chat during the game and talk with other players, making a social game, worthy of Facebook. In general, this is a fun game that does not require many hours as other Facebook games and, at any time, we take a brief game with other players and getting better with each one of them.